Doral currently experiences significant levels of congestion along its major roads. The City has taken the initiative, creating a Traffic Relief Management Plan, implementing strategies to help manage and alleviate traffic congestion. These strategies include short term, mid-term and long term improvements. The development of the strategies is coordinated with other departments of the City such as the Police and Code Compliance Departments as well as agencies outside of the City including the Miami-Dade Department of Transportation and Public Works and MDX and others. Include updating traffic signal timing based on field observers and reviews of traffic data of Doral’s major roads; creating management strategies using signal timing updates to respond to different traffic conditions. Include installing Closed Circuit TV cameras to monitor traffic conditions in real-time and recommending signal timing adjustments for both normal rush hour traffic and special events based on what the cameras show us. 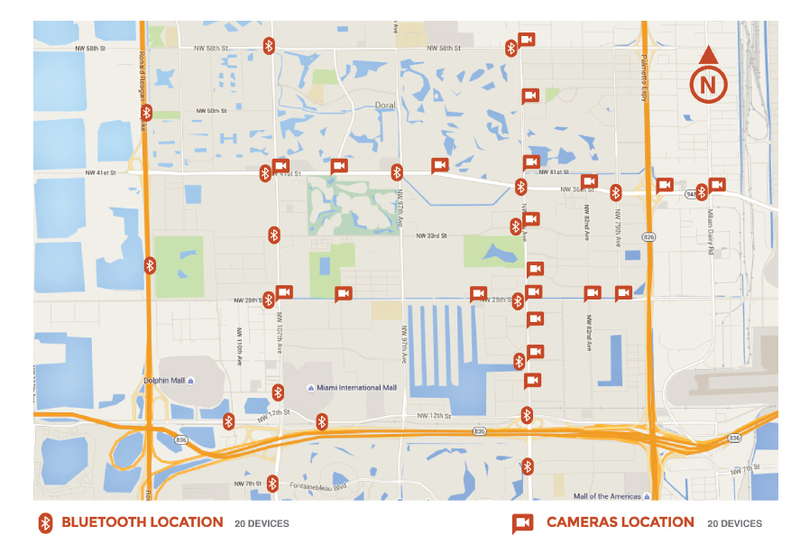 Currently, cameras have already been installed along NW 36 Street/41 Street from NW 79 Avenue to NW 114 Avenue at major intersections. Focus on identifying traffic bottleneck locations, evaluate improvement solutions that provide additional capacity at signalized intersections like additional turning lanes or extending the length of existing turning lanes. Improve traffic flow along the major arterial roads within the City of Doral. Actively monitor traffic using CCTV cameras. Adjust signal timing to respond to traffic conditions and incidents. Capital improvement projects to improve congestion at bottleneck locations. How are we improving the traffic? This assessment served to determine the need additional timing plans to better accommodate traffic variations during the peak periods. With the use of CCTV camera installations, we are able to monitor arterial performance and identify the need for signal timing adjustments or other types of traffic congestion relief strategies, such as intersection capacity improvements, the addition of turning lanes or extending the length of existing turning lanes. Overall reduction in Eastbound (peak direction) travel time between 3-4 minutes for the corridor of NW 41st Street/NW 36th Street from SR-821 to NW 7100 Block. Overall reduction in Westbound (peak direction) travel time between 3-4 minutes for the corridor of NW 41st Street/NW 36th Street from SR-821 to NW 7100 Block. With active traffic monitoring, we are adjusting green time per movement (i.e. lefts, thru, pedestrians) so the signal runs as efficiently as possible and each movement is given the green time efficiently to minimize delays due to traffic congestion. Also our team identified signal equipment malfunctions and worked with the Miami-Dade County Department of Transportation and Public Works to have them repaired. Additionally, the City of Doral is studying specific intersections for further operational analysis and to support with Maintenance of Traffic (MOT) and construction related signal timing adjustments to reduce the impact of construction activities on traffic progression throughout the day.